Ellen Banta meets after school with junior Tavahna Paige, who had a question about her homework. Photos by Jo Mathis. Ellen Banta says she first considered becoming a math teacher when she was in the ninth grade at Dearborn High School. Her math teacher was so stern that once when he caught her slouching, he kicked her legs so hard against the side of the desk that it dislocated her right knee. “And I really felt there had to be a kinder, gentler way to teach math,” she says. That helps explain the rug in her Pioneer High School math class, where students are invited to join her in lunch hour yoga or get up and stretch if they’re tense. It’s why she may occasionally meet a student at the Ann Arbor District Library to take the test in a less anxiety-provoking environment, and why she’s happy to meet students before or after school when they need some extra help. “I think those acts of kindness that we extend to each other allow us to decompress,” she says. Banta says too many students today are anxious because they’re told they have to take so many AP classes in order to be considered by certain colleges, and if they don’t maintain a certain GPA, they won’t be able to get into the right school, and if they don’t get into the right school, they’re not going to be able to get a job. After earning a degree in math education at Michigan State University and a master’s degree in education with a concentration in special education at Eastern Michigan University. 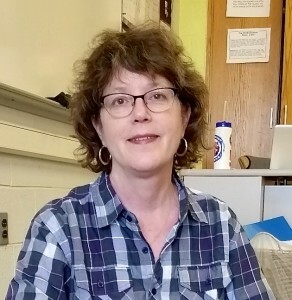 Banta began teaching at Huron High School in 1983 and is now in her 15th year at Pioneer. Surprisingly, her favorite subjects are actually history and psychology. But she knows she has the ability to take complex ideas and make them accessible to people who are trying to learn math. A pedometer Banta wore to school one week showed she walks six miles a day on the job, which she says is typical of a Pioneer math teacher. People would be surprised to realize how long it takes to grade homework and exams, she said. She said she’d love for politicians to shadow any teacher for a day. During a difficult moment with parents, she stops, takes a breath and asks herself: Why is this person acting this way? The hardest part of the job is about calling a home about a problem and hearing crying on the other end. “Because they don’t know what to do,” she says. “They know that there’s a problem, and they’re at wit’s end. And this has been going on a long time. Jeannette James, a longtime friend and fellow Pioneer math teacher, jokes that if Ellen Banta doesn’t like you, there’s really something wrong with you. Students exhibiting test anxiety can lead to a discussion about breathing and stretching and stress management. “The kids like to get on the carpet and do some stretching,” says Banta, who welcomes any student who wants to do some lunchtime yoga with her. Banta teaches five classes a day: three analysis classes and two recovery courses for those students who failed an earlier algebra class. What about the student who doesn’t see the relevance of algebra? Senior Alexis Berry says there is an endless list of ways Banta is an “amazing” teacher. And student Grace Lindeman says Banta embodies what a teacher should be. 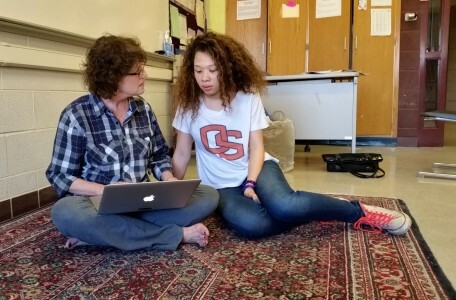 “Her unique style of teaching and enthusiasm made a challenging class something I look forward to every day,” she says, praising Banta’s empathy, genuine concern for each student’s well being, and interest in their extracurricular activities. A huge hockey fan who used to bring a big brass school bell to games when she worked at Huron and rooted for the Rats, Banta attends more athletic events than some athletic directors. She does so partly so her students see her support and know she’s part of the community; not just a teacher in the classroom. Banta recalls the time Huron was in the hockey playoffs in Flint. From the stands, she spotted some Huron kids walking around the arena, clearly looking for a fight with the other fans. Banta intervened, walking slowly towards them. “You’re going to get hurt, you know that?” the kids asked. “I go big or go home,” Banta says. Banta would like to teach another four or five years—long enough to pay tuition for her son, Liam, a senior at Skyline whom she describes as one of the most empathetic souls on the planet. Liam plans to major in psychology at MSU. After she retires, Banta says she’d had to re-invent herself, perhaps as a master gardener or Wildbird Rescue volunteer. She doubts she’d become a tutor only because she knows it would be hard to accept money from parents. For now, she knows she can count on never a dull moment. What a wonderful article on a terrific Pioneer teacher. Ellen is a gem! Everything written about Ellen is absolutely true. I am a special education teacher at Pioneer High School and have worked with Ellen for many years. She has worked miracles with many of the students on my caseload who have failed algebra and she has managed to teach them and get them to pass algebra! I am thankful for her calm, caring manner and so are many students who have benefitted from her wonderful teaching style. Anyone who has had the privilege of working with Ellen Banta knows what a treasure she is. She is the “Zen Master” of the math department. The students, parents, and staff are very fortunate to have such an exceptional teacher on board. What a great article on a wonderful teacher! My boys all loved having “Ms. Banta”. She empowered them to be good math students and they loved her class. Thank you Ellen for your extra effort. You have made a difference in the lives of so many kids! My daughter has been in Ellen Banta’s class for the past year and I’ll tell you, my daughter has historically had a very difficult time with math. From 5th grade forward she just didn’t get it. The first day in 11th grade she came home raving about how “Mrs. Banta is the greatest math teacher in the world”! She couldn’t believe how Mrs. Banta took the time to really explain a problem so that everyone in the class understood. “She didn’t get frustrated or mad or anything, she just explained it and didn’t move on until everyone got it”. My daughter was floored that she could be taught math. Her self-esteem has improved and her outlook on math is now great. Thank you Pioneer and thank you Ellen Banta, from the bottom of my heart!